I believe everyone was surprised when the first movie in the Guardians Of The Galaxy series released. The movie did surprisingly well and movie audiences left the theater blown away. I know I did. When Guardians Of The Galaxy Vol. 2 was announced, I was stoked. I began praying Marvel would do the movie justice and Guardians Of The Galaxy would be just as good as the first. I discovered the truth on Saturday. Guardians Of The Galaxy Vol. 2 delivered on everything you would hope for in this sequel. Humor, drama, and action abounded in spades. Not only did Guardians Of The Galaxy Vol. 2 deliver on these, Guardians Of The Galaxy Vol. 2 was also packed with leadership lessons. Guardians Of The Galaxy Vol. 2 opens with the team of Peter Quill/Star-Lord (Chris Pratt), Gamora (Zoe Saldana), Drax the Destroyer (Dave Bautista), Rocket the Racoon (Bradley Cooper), and Baby Groot (Vin Diesel) battling a giant space alien called an Abilisk. We see Rocket trying to repair a speaker so the team could fight with music in the background. Rocket gives up as Star-Lord tells him the music isn’t worth it. The team returns to the battle while Baby Groot tries to plug in the speaker cord. Once Baby Groot connects the cord, the music blares up and the action kicks into high gear. The team devises a way to defeat the alien creature with Drax jumping into the creature’s mouth. Gamora bemoans his action as foolish since he wouldn’t be able to cut through the skin on the inside either. They then notice a cut on the creature’s throat and exploit this weakness to defeat the creature, all with an amazing soundtrack playing in the background. While the music was an unnecessary part of the fight, the background music provided an energy that would have been lacking otherwise. Sadly, leaders are being told to listen to less music and more informational content. It’s great to learn. Yet you still have to take the time to step back and enjoy your life. Fill it with beautiful music and let the music create a new workflow energy in your life. I chuckled when Chris Pratt’s Star-Lord character made a quip to Gamora about her using swords and him using guns. Gamora had recently begun using a gun in addition to her sword. This came in handy as they were fighting the alien creature. Her gun jammed and she would have been left defenseless if she wasn’t carrying her sword in addition to her gun. She was well-versed in the use of both weapons. This came in handy when one failed. You’ll often want to focus on honing one strength or one tool. Wanting to become the best in what you do, you may decide to eschew anything else that may distract you in getting your work done. I believe this can cause you trouble in the long run. By focusing on one area of expertise, you’ll lose sight of the other skills you have. And when you need to use another skill you may not be as sharp in it as you should be. Practice multiple skills. But focus on a core set of strengths. After the Guardians of the Galaxy defeated the space creature, the blasted off of the planet. There, we see Baby Groot cooing and plastering his face (and body) against one of the windows in their ship. He was enjoying the journey into space. This was probably something Baby Groot experienced many times. Still, he found joy in the routine. Why don’t we do the same in our leadership journey? Over time we lose our sense of awe and wonder in what we’re doing. The journey becomes a grind instead of something we enjoy. Get back to your roots. Find a way to enjoy your leadership journey again. The Sovereigns, a genetically engineered race, had hired the Guardians of the Galaxy to dispense of the Abilisk. Their intent was to get rid of the Abilisk and prevent the creature from feeding on their planet’s energy source. Rocket being Rocket decided he could abscond with a couple of the Anulax batteries. The Sovereigns didn’t take kindly to this transgression or the dirty remark he had given them after they defeated the Abilisk. The Sovereigns launched an attack on the Guardians with remotely controlled spaceships. All of this happened because of the poor choices and bad actions of Rocket the Raccoon. He wasn’t able to control himself and he brought danger to him and his colleagues. You may think you are able to get away with poor behavior or behaving badly. You can’t. Your actions will catch up with you at some point. Be above the board in your leadership. Do things properly and justly. You won’t regret doing things the right way. Prepare for a really bad landing. With their ship heavily damaged, Star-Lord had to land the ship. Their landing wasn’t going to be pretty or comfortable. There was going to be bumps and bruises. Yet Star-Lord did something for his crew. He warned them of the impending uncomfortableness. He didn’t let them run into the problem without warning. Too many leaders aren’t like Star-Lord. They keep uncomfortable information to themselves. They don’t let their teams know something bad is coming up. This causes mistrust among the team. They don’t know what information they can trust and they don’t know if there’s uncommunicated information they need to know being withheld. Help your team. If something uncomfortable is coming up, let them know. Holding back of needed information is a good way to lose your employees. The Guardians of the Galaxy were being pursued by the Sovereign. They’d cleared out most of the attacking ships but there was one straggler still attacking their ship. Drax took action. He put on a spacesuit, anchored himself to the ship, and jumped out of the hatch. All while firing a big gun. His efforts dispatched their foe. However, he wasn’t able to get back inside before their ship went through a jump gate. Being outside of the ship during the jump gave Drax a wild ride. I loved his response once they landed. He laughed. And stated how awesome the trip was. The rough journey could have been bemoaned by Drax. He didn’t. He laughed about the trip he took. Are you able to laugh about the bad situations in your life? You need to be able to look back and laugh. Know you overcame something horrible and you’ve been able to move on. Rocket the Raccoon comes across as a tough little critter. He grits his teeth, growls at people, and likes to destroy things. Behind his tough exterior, Rocket is sensitive. He’s concerned about the way he’s viewed because he doesn’t feel worthy. When Rocket was called a triangle-faced monkey, you could see the words hurt him. The look on his face made the viewer sad. The words which were spoken pierced Rocket to the core. We don’t realize the power of our words. Our words have the power to bring life or death to others. Be careful with your words. Peter Quill who eventually became Star-Lord grew up without a father figure. His dad, Ego the Living Planet, left his mother to raise Peter on her own. Eventually, his mother passed away due to brain cancer and Peter had no one. So he imagined his father being Michael Knight from the Knight Rider TV series. He needed a father figure he could look up to. So he made one up. Your children need you. I understand your business or organization is important. But how much more important is the organization of your family? If you don’t know how to run your family, maybe consider running your family like a business? This may transform the way you think of your family and their importance. What is your goal here? To get everyone to hate you? Because it’s working. Rocket is constantly pushing the envelope. Not only does he push the envelope, he tries to push people away at the same time. He does a pretty good job of it. The team can feel the tension and they respond. Star-Lord spoke up though. He let Rocket know he sees through the mask. He sees Rocket trying to get people to dislike himself. And Star-Lord knows that isn’t right. Do you have problem team members? Someone who’s constantly getting on the nerves of others? Maybe their actions aren’t because they’re inept or unintelligent. These problem team members may be acting out so they won’t get close to others. When you see issues like this, press the matter. See what the true cause of the tension is. You may discover there’s a deeper issue at play. One of the new Guardians Of The Galaxy team members is Mantis. Mantis is introduced to us as a servant of Ego (Kurt Russell), Star-Lord’s father. He uses her to help him sleep. That’s not the extent of Mantis’ powers. She can also feel the emotions of others and help calm or amplify those emotions. After she revealed Star-Lord’s feelings for Gamora, Drax told Mantis to “Do me! Do me!” Drax wanted to see Mantis use her powers. There are people who are hungry to see you use your power. The skills you have are valuable to others. And they need you to use them. Stop holding back. You have skills others need you to use. Use your skills. I absolutely fell in love with the character of Drax in Volume 2 of Guardians Of The Galaxy. He had such a light spirit. He could laugh in any situation. There were so many scenes we saw Drax laughing in. Whether it was serious, scary, or humorous. Drax was willing to laugh. Laughter does something to us. Laughing can make you smile and feel better. Find time to laugh. It’ll do your body good. Ego The Living Planet sought meaning. He was a powerful being who created a planet to house his essence and then created a mortal body to inhabit. He traveled through space looking for meaning. And he finally found what he believed to be his meaning. Leaders, you’ll struggle with finding meaning. You’ll desire to know what you were created to be. Seek out meaning. You have one and you were created to fulfill that meaning. Yondu Udonta was the leader of the Ravagers, a band of space pirates. He treated these men and women poorly. Eventually, there was a mutiny and he was removed as their leader. The way Yondu treated his team was despicable. He didn’t treat them with respect. And they knew he didn’t respect them. This caused a sense of resentment among the group. Their feelings moved from feeling to action and they revolted. Be aware of how you’re treating your team. Are you treating them with respect or as a means to an end? By treating your team with a lack of respect, you’re communicating you don’t care about them. They will get tired of this and either leave or mutiny. Change your ways if you’re not treating your team well before they make you change. Peter Quill heads to the planet Ego created and was a part of. There, Ego shows Peter the potential within him. He can concentrate and pull energy from the living planet. When Peter closed his eyes and focused his energy, he was able to create a ball of blue energy. While you won’t be able to conjure up a ball of blue energy, you do have untold potential within you. You have so many skills and abilities it’s ridiculous. Work on your potential. Figure out what you’re good at. Then go do it. I was young. I was greedy. I was stupid. We discover Yondu had been expelled from the real group of Ravagers and he was leading a rebel faction. He’d been expelled from the group because of his improper actions. He’d been trafficking children to Ego. And Peter Quill was just one of those children. He’d done this because of his inexperience, greed, and stupidity. 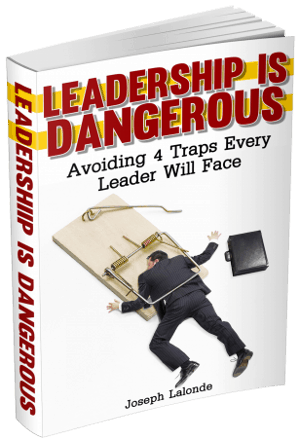 Most leaders have been there at one point or another. Whether through inexperience, greed, or stupid, we’ve all made bad choices that impact us long after the deed is done. Be cautious of the actions you take. Weigh whether or not they’re the right thing to do. Then do the right thing. You were the one who wanted to win. All I wanted was my sister. Nebula (Karen Gillan) was Gamora’s sister. Thanos had pitted the two against one another with the loser having a portion of their body replaced with a mechanical replacement. Gamora would always win in the fights and Nebula would then have her body parts replaced. This turned Nebula bitter towards Gamora. This is another reminder of how important our family is. The way you treat them impacts their actions. Love your family, leaders. So… We’re saving the galaxy again? The Guardians Of The Galaxy had to save the galaxy once again. While Rocket saw a financial side to saving the galaxy another time, there’s something else that can be discerned from this quote. A leader’s job is never done. There’s always the next action step to take. There’s always another problem to solve. Know that once you accomplish what is before you, there’s going to be another task at hand. Mantis had the power to help lull Ego the Living Planet to sleep. She thought she could only do this if he allowed. Drax believed Mantis had the power to put Ego to sleep even if he wasn’t a willing participant. He challenged her to try. She did. And she succeeded. Mantis was able to put Ego to sleep. What do you believe about others? Do you believe they have the power to accomplish great things? When you begin to believe in others (and express your belief in them), they begin to do great things. Your team will live up to your expectations. Make sure your expectations for your team are positive and powerful. The Guardians Of The Galaxy had to come up with an idea of how to defeat Ego the Living Planet. Their only idea was to have Baby Groot plant a bomb at the core of the planet. The idea was terrible. But it was the only idea they had at the time. Do you know what? The terrible idea actually worked. They were able to destroy Ego with the terrible idea. Don’t dismiss an idea that seems bad. That terrible idea may be the key to the next level of success. The trigger to the bomb that would blow up Ego the Living Planet had two switches and two red buttons. Rocket relayed the instructions to Baby Groot. When asked to repeat back the instructions, Baby Groot wanted to push the wrong button. Baby Groot ran off towards his goal with Rocket thinking Baby Groot was going to press the wrong button. After placing the bomb on the core of the planet, we see Baby Groot agonize over the decision for a few seconds. Do I press the left button or the right button? He eventually pushes the correct button and ends Ego’s reign. Doing the wrong thing can be tempting. The wrong thing often looks good. But the wrong thing is still the wrong thing. Yondu believed he did nothing great with his life. He’d led a band of pirates and then failed at that. He believed he needed to make up for his past wrongs. He needed redemption. With Star-Lord’s life in the balance, he chose to act. He raced to help save Star-Lord. In doing so, he redeemed himself. Not only with the Guardians but with the Ravagers. People are going to fail. They’re going to epically screw up. This doesn’t mean they’re worthless. This means you now have the opportunity to help them see redemption is possible. Allow people who have failed to redeem themselves. Sometimes that thing you’re searching for your whole life is right by your side and you never see it. Peter Quill longed for a father figure. He desired to be reunited with his biological father. Sadly, he didn’t realize he had a father figure. Someone who was more of a father than his own flesh and blood could ever be. Yondu loved Peter like a son. He didn’t turn Peter over to Ego because he knew the fate he’d be giving Peter. Instead, he kept him. He trained him. He showed him how to live and survive. Yondu was the father Peter longed for (and actually had). You may be pursuing something with your whole heart. Longing for fulfillment or joy or happiness. These things are there for your taking. They’re right in front of you. You just have to be willing to see them and accept them as they are. 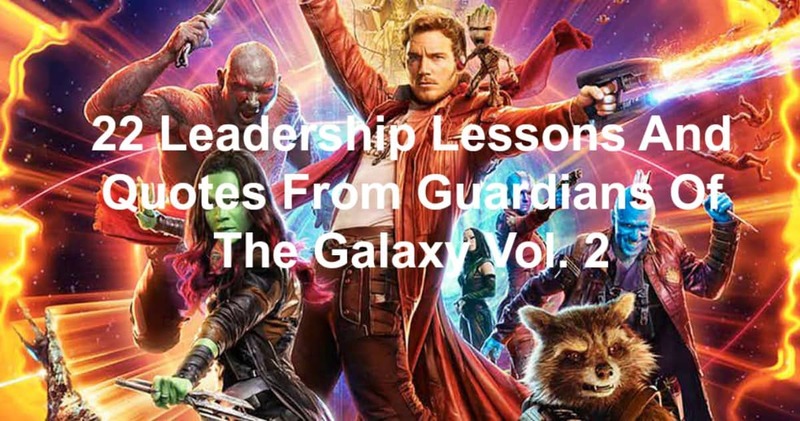 I know what the title of the article says: 22 Leadership Lessons And Quotes From Guardians Of The Galaxy Vol. 2. So, why’s there 23? Well, that’s because Marvel and Disney Studios gave a little extra with Guardians Of The Galaxy Vol. 2. Most movies have one or two stingers (after-credit scenes). That’s not what Marvel and Disney did with Guardians Of The Galaxy Vol. 2. With Guardians Of The Galaxy Vol. 2, you get not one or two. Not even three or four. There are 5 stingers for Guardians Of The Galaxy Vol. 2. Are you giving your team a little extra? Are you rewarding them for going the extra mile? Give them a little extra for all the hard work they do. I don’t know what else to say about Guardians Of The Galaxy Vol. 2. The movie is a masterpiece of the big screen. You’re going to laugh. You’re going to cry. Heck, you might even get a few leadership lessons from Guardians Of The Galaxy Vol. 2. You’re going to enjoy yourself if you see Guardians Of The Galaxy Vol. 2. So, go see it and have a laugh, a cry, and a mental workout. You won’t regret seeing Guardians Of The Galaxy Vol. 2. Question: Have you seen Guardians Of The Galaxy Vol. 2? If so, did you find any leadership lessons in Guardians Of The Galaxy Vol. 2? If you haven’t seen Guardians Of The Galaxy Vol. 2, go see it now! Or let me know your favorite leadership lesson from Guardians Of The Galaxy Vol. 2 in the comment section below. I’m waiting to hear from you!